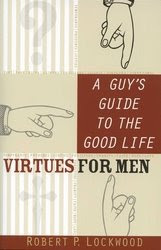 A Guy's Guide to the Good Life: Virtues for Men, by Robert P. Lockwood, is a 145 page book that discusses the 7 virtues. Part one of the book is the cardinal virtues (prudence, fortitude, temperance, and justice) and part two being the theological virtues (faith, hope, and charity). Lockwood uses quotes from Dante as well as personal experiences to help the reader not only to understand the virtues better, but also to show the reader how they can be seen in life. I had high hopes for this book. 1) I am a guy. 2) I could use more of these virtues. 3) By the cover art I thought this book might be a throwback to the 50's (a time of Leave it to Beaver and simpler times). To say the least, I was very disappointed. I am sorry to say that I had to force myself to finish this book. First, looking at the title, I thought it would be a book for...well guys. But after finishing the book I found myself wondering, "Which part was for guys?" Sure the book talked about beer, baseball, basketball, football, and eating, but that was about it. Second, the book was basically all short stories. I don't have a problem with this, I will shed a tear with the rest of them over Chicken Soup for the Catholic Nerd, or Surprised by Truth books. This book was different. I felt like I had asked the 80 year old neighbor to tell me about how he met his wife and then was barraged with 50 long, seemingly unrelated, stories. Some stories would branch off into other stories, then come back to the original story, but then leave me confused and wondering what it had to do with the topic at hand. Here is one condensed example. Lockwood tells us that he listens to a folk station in his car, but only when his wife isn't around. He explains that he is not a revolutionary or stuck in the 60's. When he was a kid Burl Ives did a popular take on "The Big Rock Candy Mountain" and talked about a land full of candy for children. He tells us that the original song was much more dreary and was a land of cigarettes and alcohol. The story continues of a time when he was 6 years old at Trout Lake and he was coaxed into singing by his "old man". What song did he sing? Nope, not "The Big Rock Candy Mountain", he sang "Sixteen Tons". He sang this sad song as a happy tune. He said he sang it because it was the only secular song he knew. He ends the story by saying that old folk music reaches out to us. What virtue was this for? Give up? Justice. I don't want to babble on, but I didn't feel that the author relevant stories and he did not explain his stories well. But with Christ we can turn all things into something positive. The book does show what the 7 virtues are, and the reader will (at least to some degree) understand what they are. This review was written as part of the Catholic book Reviewer program from The Catholic Company. Visit The Catholic Company to find more information, or to purchase A Guy's Guide to the Good Life.